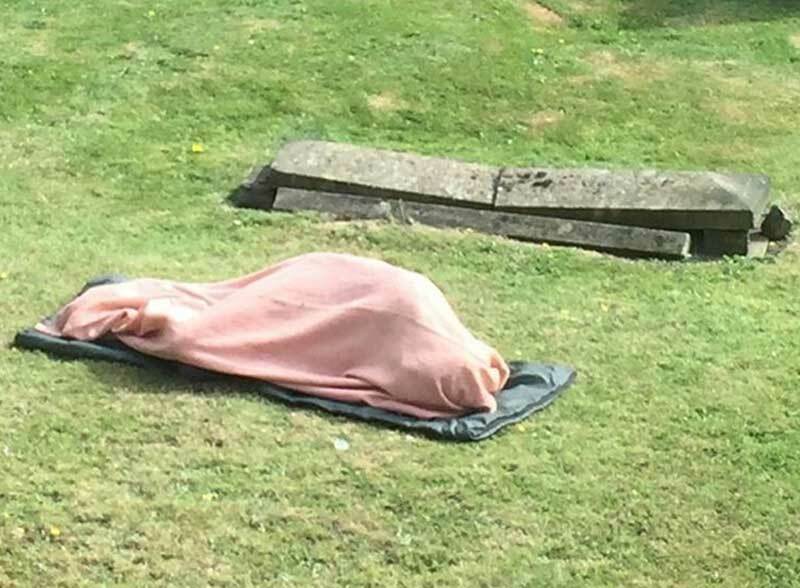 Passers-by were surprised when they walked past a 'body' lying amongst the gravestones in the churchyard of St Mary's Parish Church in Ashford, Kent. Shrouded from head to toe in a brown blanket, the unusual sight turned the heads of people strolling through the churchyard in the town centre at about 3.30pm on Saturday. Steve Salter said: "It seems it was a rough sleeper taking refuge and having a kip in the churchyard but you should have seen the looks the sight was getting from passers by. He was lying parallel with another gravestone and just keep covering himself over. There were lots of people walking past at that time of day. "Several people went over to see if he was alright but he just waved his arms at them to go away. At one point some bellringers even came out of the church and walked past him. He was there for about an hour but then it started raining so he collected his stuff up and went."